Whether you are researching, gathering, writing, organizing, displaying or editing information for publication on web properties, content development and enhancement is the one thing that you should be focusing your efforts on. In fact, what you produce in terms of content will have great influence on the popularity and profitability of your website. Conversely if your content is, shall we say, lackluster, people may ignore it or even worse never see it due to a lack of presence in the search results. Definitely not the reaction or response that you want from potential clients or customers. Content helps tell a story, your content helps build trust with your audience and it helps educate your audience on whatever it is that you are trying to communicate to them. Your content can be short in nature or longer, but it must deliver value to the audience. Your online content should tie into your offline messaging and vice versa. In fact with regards to your messaging, it is not a matter of online vs. offline, it is all about integration and consistency. It is about delivering the right content at the right time to the right person. A well established content strategy will allow you to plan out your content and map out the best ways to generate interest in your brand, your web property and your service offering. 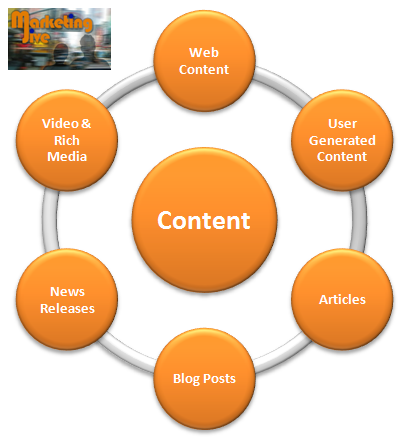 The key to generating interest is just that, the content must provide value to someone. In order to accomplish this it (the content) must be useful, easy to interpret and timely with regards to the user's intent. It also helps if your content is somewhat unique. How many times have you visited an e-commerce site and checked out a product description only to visit another vendor site and see the exact same product description? This does nothing to entice me to select one vendor over another. Perhaps Maki, author of http://www.doshdosh.com/ blog said it best when he stated that "content differentiation helps you survive & succeed in a crowded space". The Web indeed is a hyper-competitive environment. Anytime that you have the opportunity to provide unique, informative content, do it. Your audience will appreciate it. I am referring to here is engagement. By establishing an effective content development strategy for your web properties, you improve your chances of increasing site "stickiness" and the chance of a repeat visit. We know that people's attentions spans are, for the most part, short. As mentioned above, the Web is uber competitive and your content is only as good as your visitor interprets it to be. Not everyone is articulate, but when it comes to your Web content, your messaging should resonate with your visitors. As a result your content should be clear and concise and be presented in the manner in which provides the best value to your audience. Communicating your unique competitive advantage can go a long way in demonstrating your expertise. Avoid using industry jargon. The wise content developer will speak in the language of their audience and avoid marketing, sales and industry balderdash. From an SEO perspective, one of the greatest gifts that you can receive as a result of creating useful content is a link to your content from other websites or blogs. Especially if they have found value in your content. more quality links that you have pointing back to your site, the more authoritative search engines such as Google will treat your content. Earning the respect of the search engines (through their complex ranking algorithms) is part of earning the respect of your audience. In addition, as you GUIDE users through your content, you can establish trust, which you can measure via your subscribers, repeat visitors, traffic from social networks, and community buzz or simply with your monthly visitor traffic. If your content is of value, you will experience increases in all of these metrics and your audience will continue to engage with your web properties. Guiding your audience to the information that they are looking for via well established content will help build that relationship that you need to establish in order to be successful in the online arena. From an online perspective that may mean providing user generated content to help establish trust in your product or service offering. It may mean establishing a "how to" video to communicate how to use features of your product. From a B2B perspective, it may be as simple as providing reassurance to your audience to help reduce the amount of risk your prospect has when making their purchase decision. Regardless of your situation, use your content to provide your users, your customers and your site visitors to a better online experience.